Please note: since The Funkie Junkie Boutique is temporarily closed, the Friday Focus products will not be offered at 15% off. Hi, thank goodness it's Friday! It's a really good day today as I've also taken a day's holiday to do some much needed crafting! 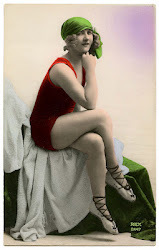 It's Sue here and today's Friday Focus is all about Crinoline. 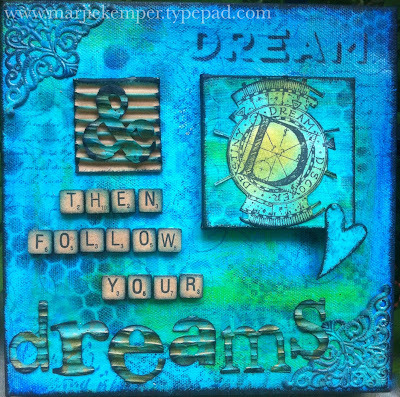 I absolutely love this fabric, it is so versatile whether you are die cutting, stamping or painting. 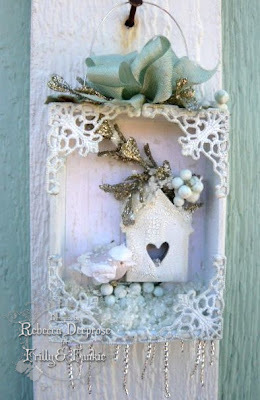 I recently bought the Tim Holtz snowflake die and thought it would look great made from Crinoline! I just used one thickness of the fabric which cut really well. I then folded it as you would if you'd cut it from paper or card and then took a needle and thread and ran the needle through all of the folds. 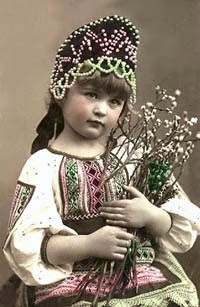 The snowflake starts to gather as you pull the thread tight. 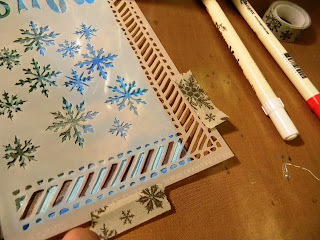 Once you reach the end sew the two ends together to complete the base of the snowflake and then I stuck the centre panel with some silicone glue. 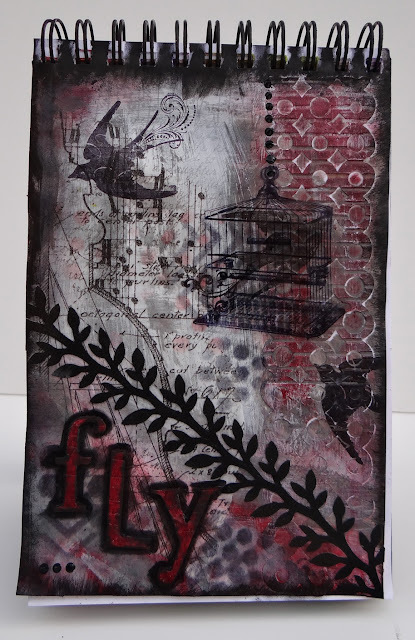 Another thing I love to do is stamp onto Crinoline. 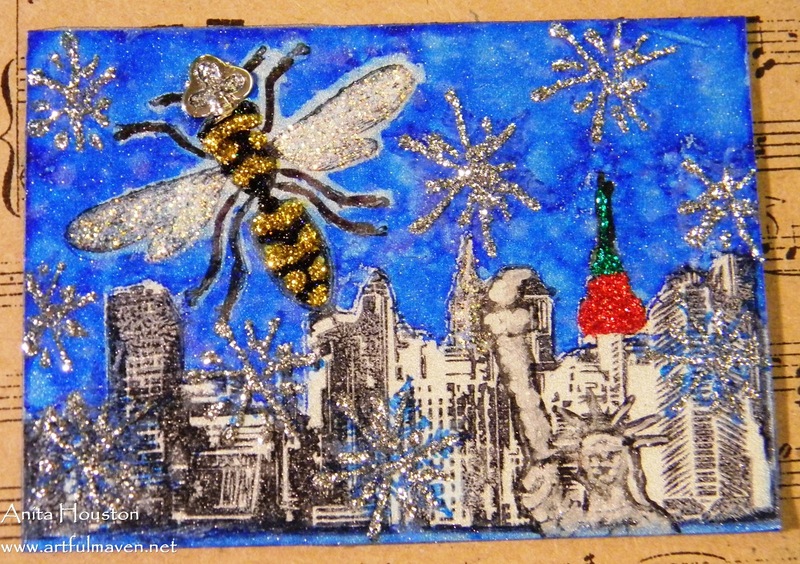 I've used Coffee Archival ink and this piece was intended for a background layer so I've used a large stamp. To be sure the ink has set always heat set it (apologies for the shadow of my heat gun!). This makes sure that if you wanted to paint it as well the ink won't bleed. Here's how I used the snowflake, I just added a shrink plastic snowflake and a bead to it. The background piece, I've used on this birthday card for my niece, it adds a different dimension to your projects. I hope you've enjoyed today's Friday Focus and you all find some time to craft this weekend! Happy Saturday everyone! A big thanks goes out to all of our followers and participants! We appreciate all of you. 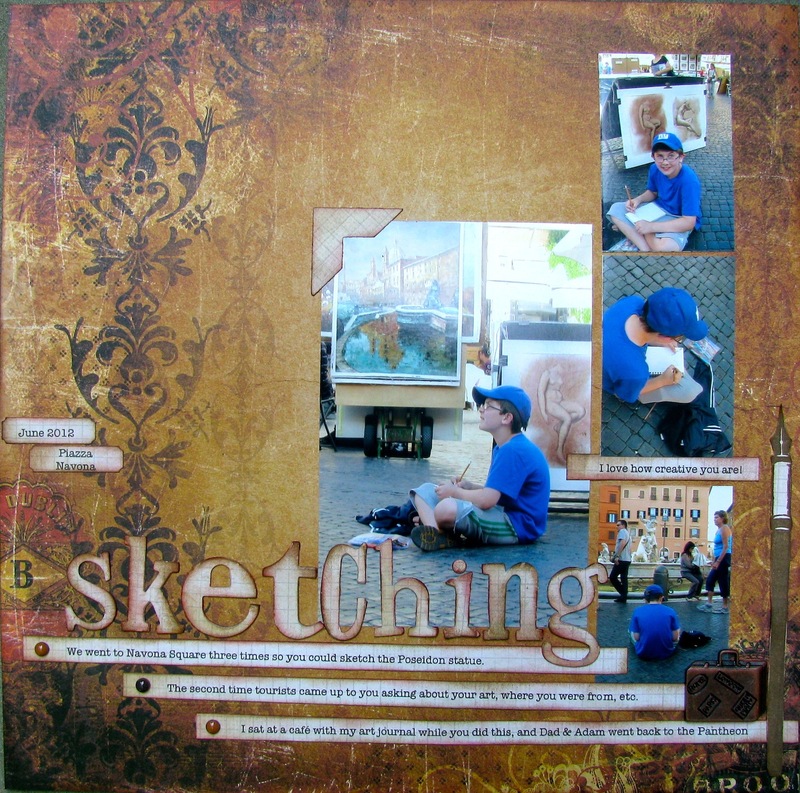 Anita Houston here of The Artful Maven Haven. 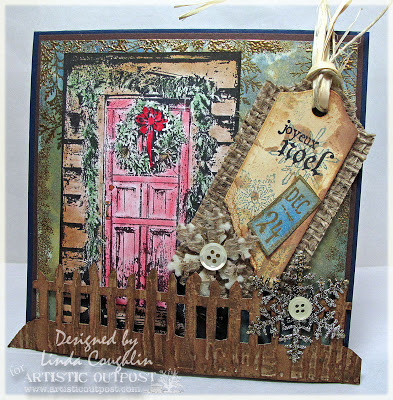 It's my turn to host the Saturday StepxStep, and I've decided to show you how I've made this fun Christmas tag card using Dylusions, as well as show you snowflakes made with some of Ranger's new products. 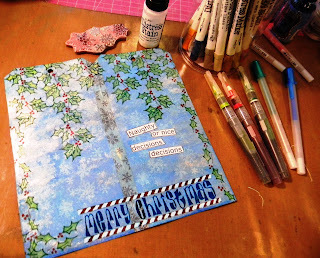 Using Tissue or Washi Tape, tape two Manila Jumbo Sized (#10) Tags together, on both sides. Trim the excess off. 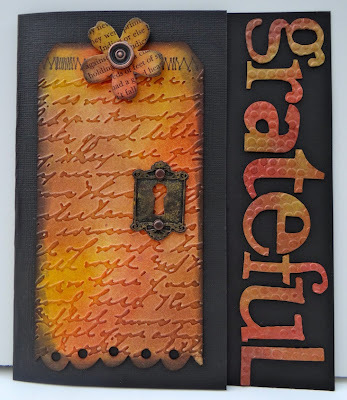 Using Picket Fence and Metallic Brushed Pewter Distress Stains, apply both randomly on one side of the tag card. 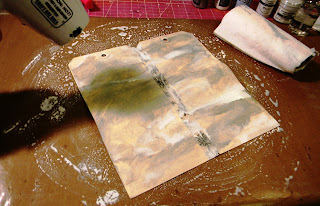 Begin drying with a heat tool while misting with water to blend the Stains. Flip the card over and do the same thing on the back. If there are really wet areas use a paper towel to help dry. Spray the tag card with London Blue Dylusions Ink Spray. Dry thoroughly, and then do the same to the back. 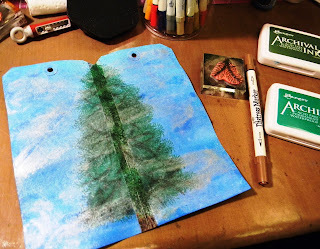 Using the Pine Needle Cluster image from the Dylusions stamps, begin stamping the image in a pine tree shape, alternating green colors (I used Olive and Emerald.) 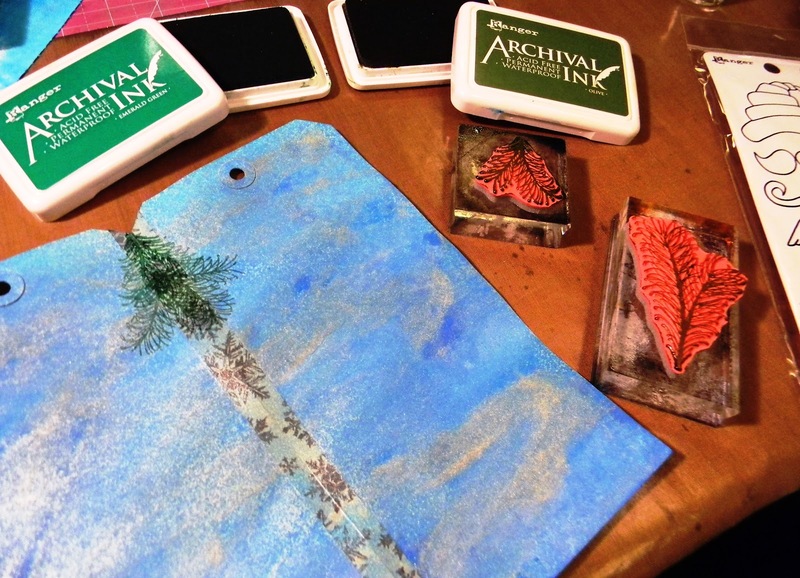 from the Archival line of ink pads. Dry. Using the same stamp image, color only the center stem of the pine needle using a brown color (I used Vintage Photo.) of Distress Marker. Randomly stamp this on top of the green areas, and apply color as needed. Color in the rest of the Tissue Tape using the same color for the trunk. Dry. 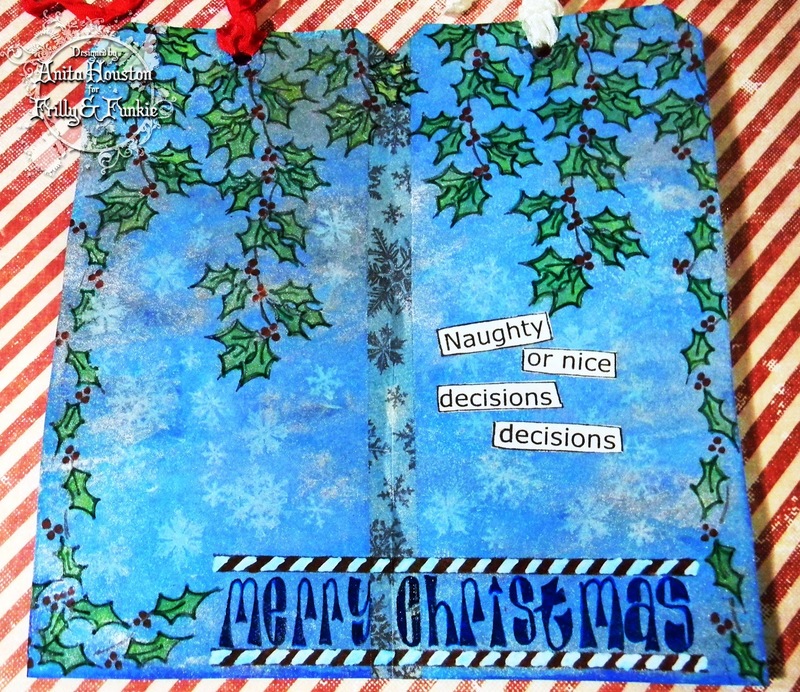 Using the Snowflake Stencil from Dylusions, place it down on the tag card so that the Candy Cane Border is right in line with the border of the bottom on the card, and tape it down. 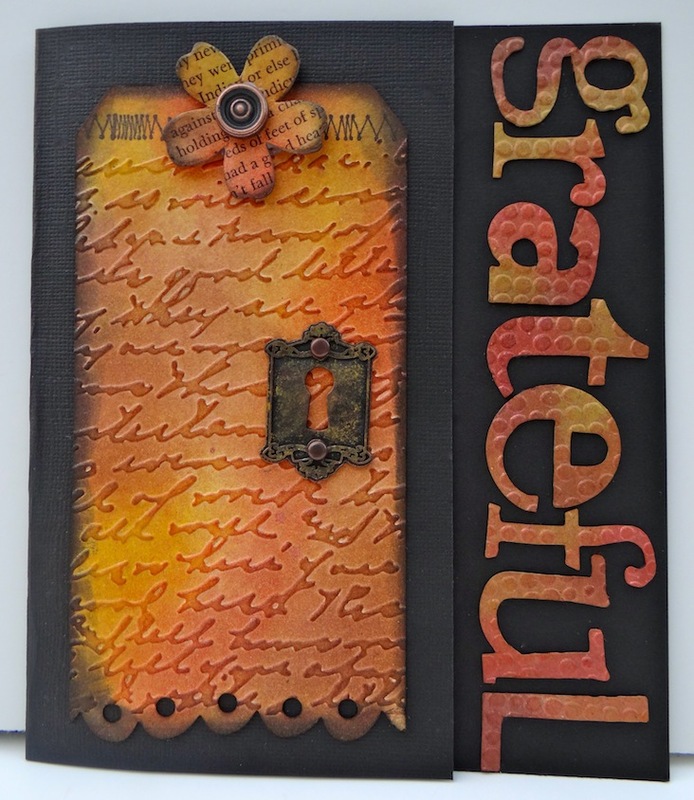 Use Barn Door and Picket Fence Distress Markers to color in the border. 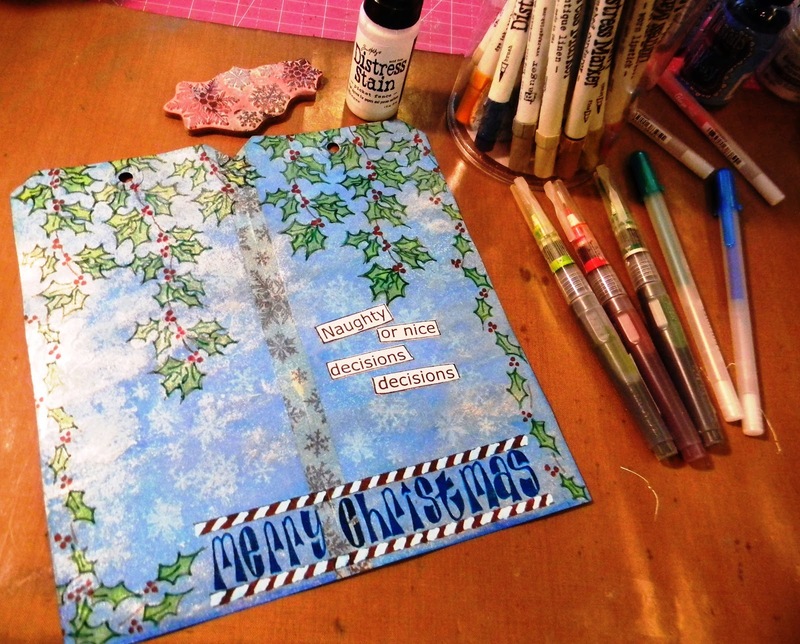 Use Glaze Pens to color around the Dotted Lines in the trim around the Candy Cane. Dry. Flip the card over and work in the inside area. Using the two Holly Borders and the Merry Christmas Border, stamp the images in Jet Black Archival around the edges of the tag. Color these in with Water Pens that have been filled with Dylusions Ink Sprays (I used Postbox Red, Fresh Squeezed Lime, and Cut Green Grass.) Use Glaze Pens to color in the words, and Distress Markers for the border of the words. Randomly stamp Tim's Snowflakes in White Picket Fence Distress Stain in the blue areas of the tag card. 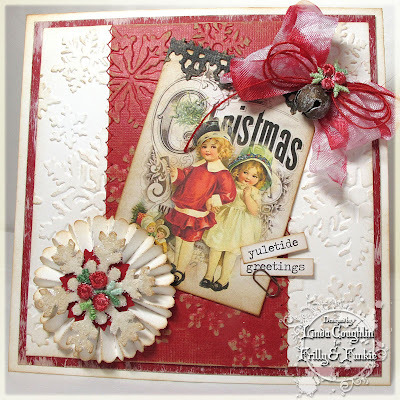 If you want some glitz, use Christmas Red Stickles to apply to the berries once the remainder of the card is finished. 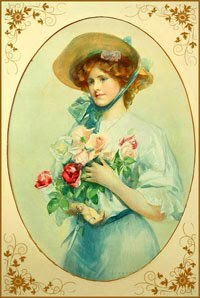 Stamp and cut out a sentiment, and adhere it. Back to the front of the card (This was done last to keep snowflakes looking their best.). Lay the Snowflake Stencil over the tag card and tape it down where you want it. Use the Emboss It Dabber to apply the fixative to the stencil through the snowflakes. 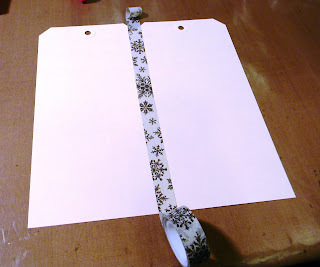 Remove the stencil, and place the tag card on a scrap piece of paper. 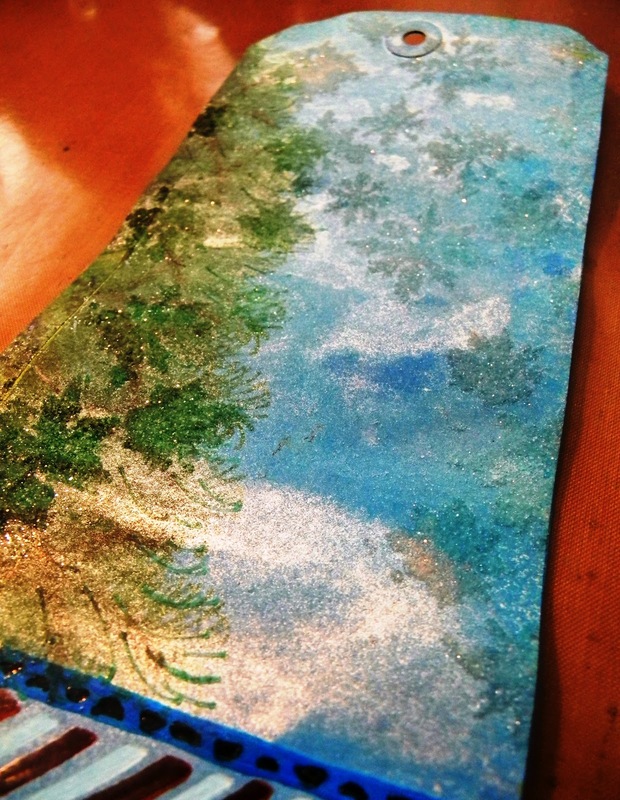 Sprinkle Sticky Embossing Powder over the fixative. Turn the card on its side and remove the excess powder. Heat the snowflakes with a heat tool until powder is melted. When cool, the snowflake will be sticky...how cool is that?!? 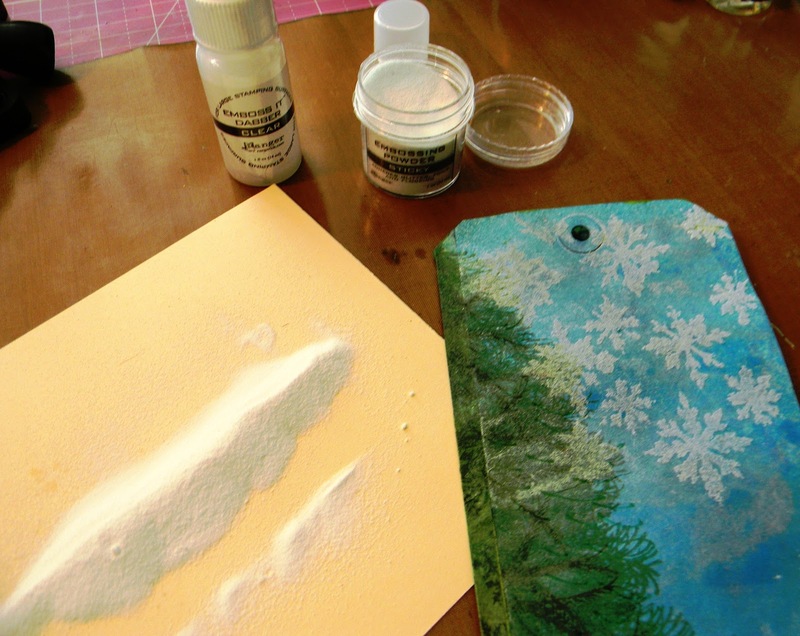 Sprinkle Rock Candy Distress Stickles Dry Glitter on the snowflakes. Turn card on its side and remove the excess. 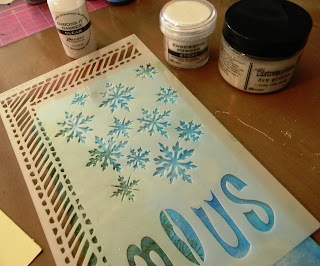 Repeat process if you want more snowflakes on the card. 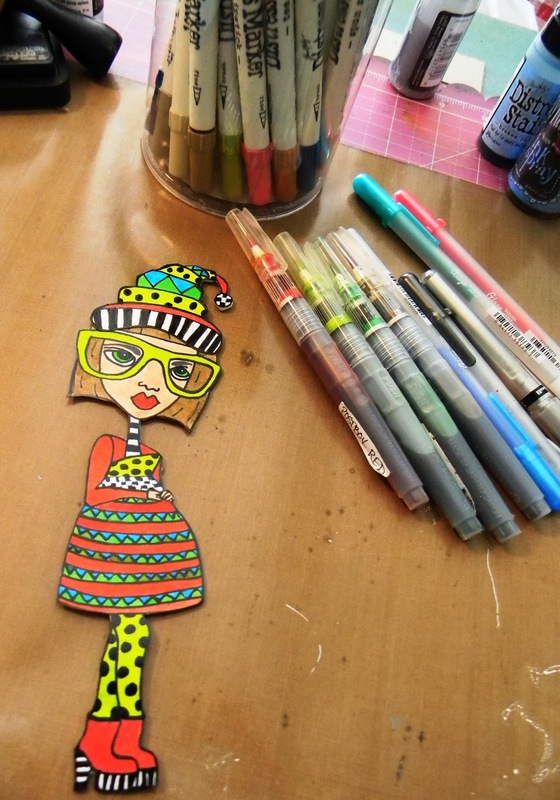 Stamp a quirky person image from Dylusions Stamps, and color it in using the Ink Spray in Water Pens as well as Distress Markers. 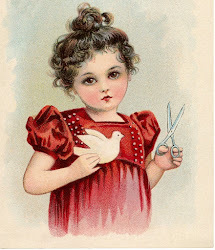 Attach this to the front of the card using foam tape. 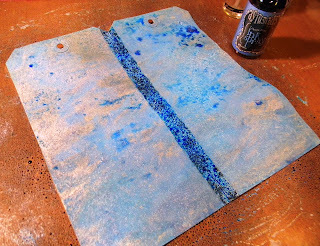 Color Seam Binding with Barn Door Distress Stain, wad up, and dry. Tie the ribbon to both holes of the tags. 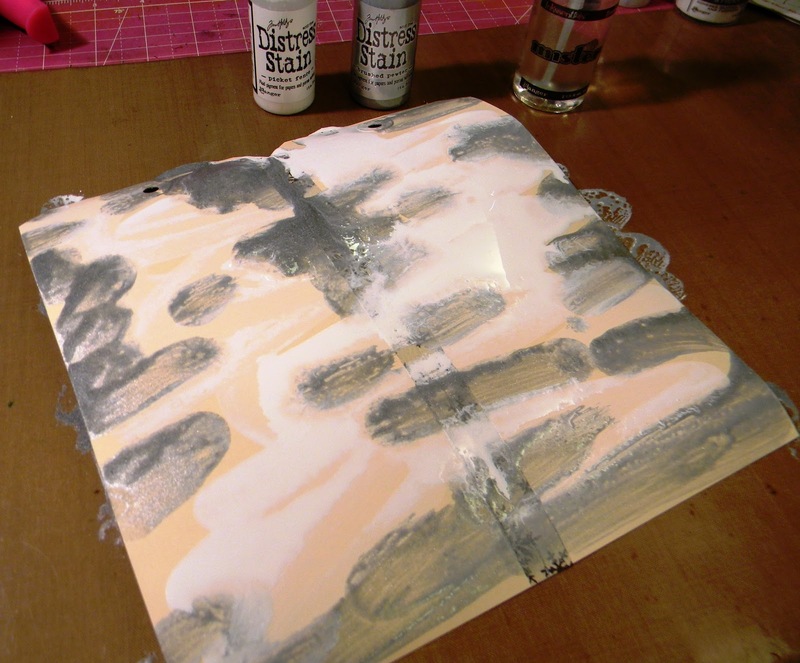 Using Clear Rock Candy Distress Stickles and any other color, highlight certain parts of the outfit. Let Dry. Thanks for visiting us today. 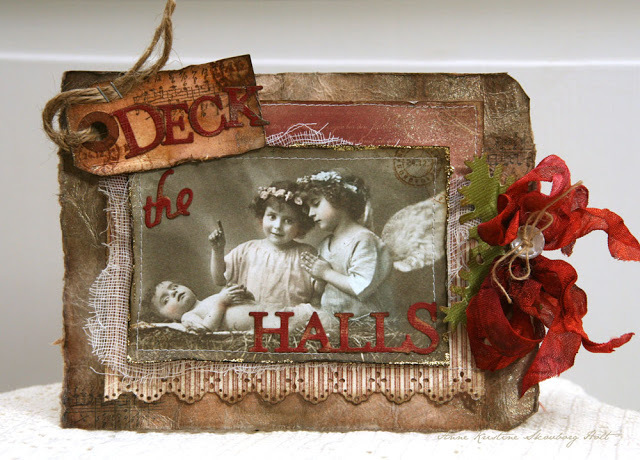 Remember there's still time to play along with our Chipboard and Metal challenge. It's open through Tuesday, November 27, and all are welcome to join! 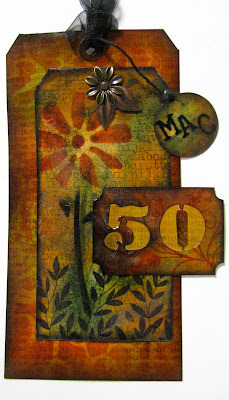 Love the way she has used the small tag and the wonderful background made using Tim Holtz's ink refresher technique. The pops of red really finish it off. Congratulations to you, Anne Kristine. Please email Linda at thefunkiejunkie@gmail.com for your Funkie Favorite sidebar badge. 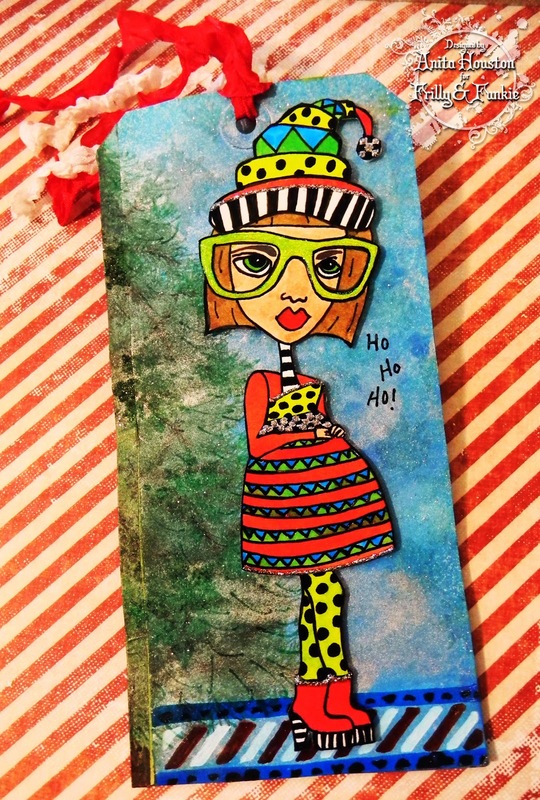 And we have another winner too - for a $25 gift certificate to The Funkie Junkie Boutique. Great timing too, with the 10% moving sale going on! Our gift certificate winner, selected my Mr. Random.org is entry #8 Claudine C. Congratulations Claudine! 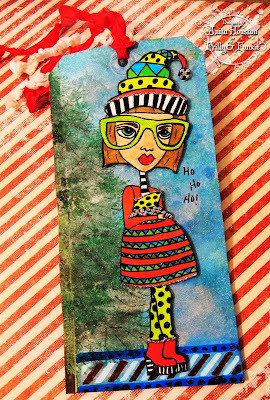 Please email Linda at thefunkiejunkie@gmail.com for your gift certificate code. Thanks so much to everyone who played along. 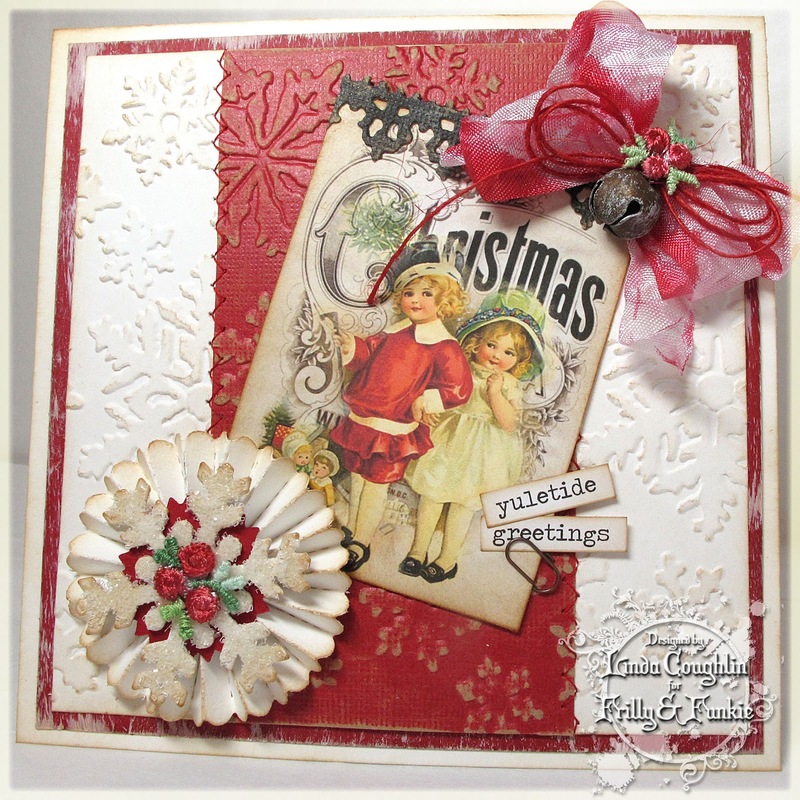 We are so glad to have you joining in the fun with us here at Frilly and Funkie. 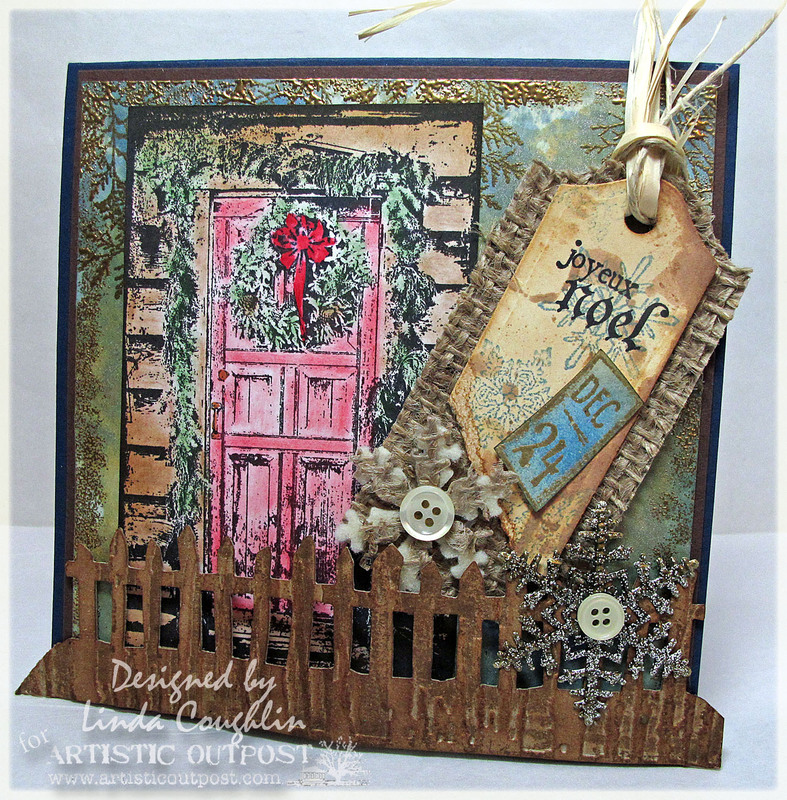 Our current challenge will be kicking off week #2 shortly with the Funkies interpretation of the Chipboard and Metal challenge theme. The challenge is open until November 27th so there is plenty of time to join in. Hope to see you there!